Mangaluru, Nov 02, 2018: This Diwali, give the traditional sweet boxes a miss and choose a new festive box with a twist. 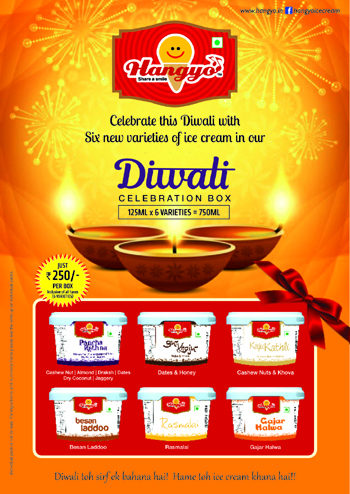 After the much loved ’Celebration Box’, Hangyo Ice Creams Pvt Ltd are back with something more unique and delicious this Diwali. The ’Diwali celebration box’ will bring together as many as six flavours of sweets from across India. "Diwali is a festival of sharing. Traditionally we gift each other sweets. We at Hangyo IceCreams wanted to give our patrons a different and a new experience during this festive season. We have introduced a range of sweets infused ice cream. There 6 cups of Icecream of 125 ml each in a special box made with traditional Indian sweets. This will be a new gifting solution for all." said Mrs. Deepa Pai, Vice President , Hangyo Ice Creams Pvt Ltd.
A Pack of Diwali Celebrations box contains tempting flavours like ’Pancha Ratna’, literally meaning ’five gems’ that has nuts like cashew , almonds, raisins, dates and a hint of coconut. The second is Besan Laddoo flavour , a typical sweet made in Maharashtra , tastes like the mouth-watering laddoo, a must have sweet during festivities. The third one is the Gajar Ka Halwa aka carrot halwa which is commonly eaten in all parts of India. This will be served cold in a specially made ice cream . Fifth is the well known sweet Kaju Khatli made from Khoa and cashews. The Ice Cream is well blended with the sweet which will melt in the mouth with its rich taste. And lastly the Rasmalai Ice Cream known as the favorite Indian sweet since age will complete your Diwali celebrations. The limited edition Diwali Celebration Box will have six cups of 125 ml and will be sold at Rs 250/- each. Hangyo Ice Cream, a Karnataka’s fastest growing ice cream brands has won six national awards in the ’Great Indian Ice Cream Contest 2017 including two gold medals for its Standard Vanilla Ice Cream and Cool Kids in the kid’s category, 3 Silver Awards in Best Chocolate Category, Mango Sorbet in the Sorbet Category and the Most Innovative in the Innovative Category. Bronze Award in the Standard Vanilla Frozen Dessert Category.